Yet happiness is born of a trifle, feeds on nothing." Born in an air-raid shelter at the height of the blitz in London, Betty Weir was destined to lead anything but a dull and boring existence. Her gift has proven to be an enlightenment not only to her, but everyone who has ever had the benefit of spending time with her. "From a young age, I have been able to 'sense' energy surrounding people. Sometimes as a child I could 'smell' this energy. Sounds strange?? This was to be part of accepting and becoming comfortable with the gifts that I have been given. I now work with cards, psychometry, crystals and numerology as well as reading auras and photos. I offer intuitive counselling, massage and reflexology together with healing. Being a Reiki Master allows me to teach and share this great discipline. I have worked extensively in Western Australia as well as the United Kingdom and South Africa." "- Why do I enjoy this work? I believe that we need to help light the Pathway for others as my Pathway was lit many years ago………." "When I first decided to go into business for myself some time ago, many people asked me, "What are you going to call your business?" I had no idea for quite a while. Many names went through my head but none sat quite right. Then one day, yet another "what are you going to call your business" question from a friend. From "out of the blue" came Amethyst Cove. My feeling was that this was just so right & I felt the interpretation was to be 'Healing Sanctuary'. The Universe sure works in mysterious ways. Held in high esteem by colleagues and clients alike, Betty has spent many years building an honourable reputation in her adopted home of Perth, Western Australia and in early 2008 relocated to regional W.A. 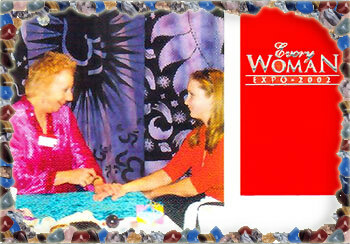 where she continues to give her readings, workshops and consultations. Betty also tours the country attending festivals and expos, spreading the light to those isolated by distance, but not spirit.